The Fed finally decided to hike and the Greenback plunged as a result. Wait, what? That’s right! And if you’re wondering why the Greenback plunged, or maybe you just wanna know some of the most important points from the Fed’s March statement and presser, then here are the key highlights that you need to know about. The Fed finally voted to hike rates for the first time this year, raising the target range for the Fed Funds Rate by 25 bps to a new target range of 0.75% to 1.00%. However, the decision was not a unanimous one, as you can see below. 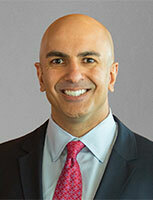 The voting record shows that Minneapolis Fed President Neel Kashkari was the sole dissenter. This is not really that surprising, though. If you can still remember my Roundup of Recent Fed Statements, I noted that Kashkari thinks that the labor market still has “more room to run” in one of his recent speeches. This is the same statement he had in a February 7 blog post, wherein Kashkari explained the reasons why he voted to keep rates steady during the February FOMC statement and why he will likely continue doing so. As you can see below (click the pic to enlarge), the Fed’s economic projections during the March FOMC statement was mostly unchanged from the forecasts it presented during the December 2016 FOMC statement. There were some very slight shifts, which can be seen in the central tendencies and ranges, that caused the median projection to tick higher or lower here and there, but forecasts were unchanged for the most part. Regarding Yellen’s commentary on the Fed’s assessment of the economy, there was nothing really remarkable or new, except with regard to business investment. In both the December 2016 and February 2017 FOMC statements, Yellen noted that “business fixed investment has remained soft.” In the March FOMC statement, however, Yellen said that business investment “has firmed somewhat.” That didn’t really affect the Fed’s growth projections, though. The Fed’s rate hike projections were essentially unchanged, as you can see below. The forecast for the Fed Funds Rate for 2017 is still at 1.4%. And using the higher bound of the new target range (0.75% to 1.00%) as the starting point, that means that the Fed is forecasting 1-2 more rate hikes at the standard increment of 25 basis points. For 2018, the Fed is still sees the Fed Funds Rate at 2.1%, which means 4-5 additional rate hikes, using the current target range as the starting point. The projection for 2019 is slightly more interesting since it was upgraded slightly from 2.9% to 3.0%. This means 8 additional rate hikes versus 7-8 hikes. Still essentially unchanged, though. 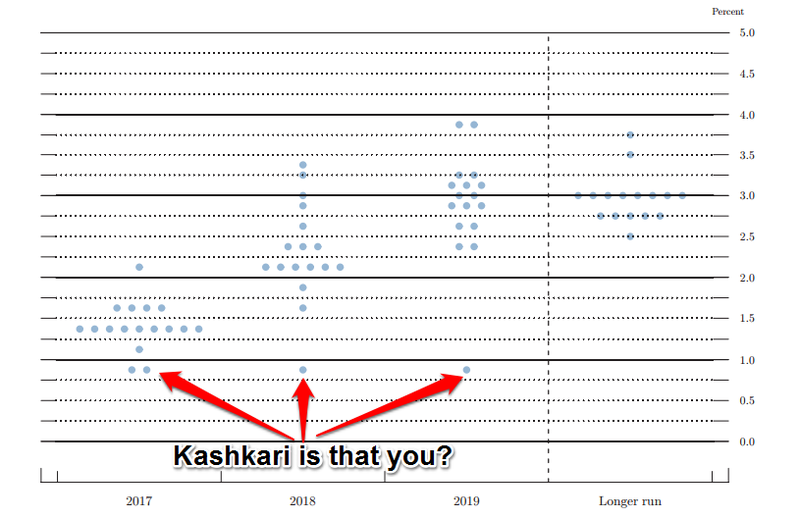 However, if we look at the so-called dot-plot, we can see that Fed officials have become slightly more hawkish. If you don’t understand what you’re looking at, let me break that down for you. There are two Fed officials who think the Fed Funds Rate should only be at 0.875% by the end of the year, unchanged from December. This means that they would agree to only one hike in 2017 at most. Kashkari is very likely one of those Fed officials. He did vote against a rate hike after all. I guess that also means that we can expect him to continue voting against future rate hikes now that the upper range of the Fed Funds Rate is at 1.00%. Moving on, there is one Fed official who thinks the Fed Funds Rate should be at 1.125%, which means he or she supports 1-2 rate hikes within the year. Interestingly enough, there were four of them during the December 2016 FOMC statement. The three other Fed officials apparently moved up to the camp that thinks 1.375% should be the Fed Funds Rate by the end of 2017, since there were now nine Fed officials who belong in this camp, up from six back in December. This means that they support 2-3 rate hikes this year, which is why I said that Fed officials have become slightly more hawkish. Unfortunately, the dot-plot reflects the opinion of all FOMC members, voting and non-voting members alike. And for all we know, those three hawkish Fed officials could be non-voting members, which would make the switch to a more hawkish stance meaningless, since they can’t vote on it. Anyhow, the rest of the Fed officials support 3 or more rate hikes. So, that means that 14 out of 17 Fed officials are open to 3 rate hikes this year, with 5 of the 14 Fed officials open to more than 3 rate hikes. Yellen then added that the rate hike “reflects [the Fed’s] view that waiting too long to scale back some accommodation could potentially require [the Fed] to raise rates rapidly sometime down the road, which, in turn, could risk disrupting financial markets and pushing the economy into recession.” This is the same thing she said during her March 3 speech. Overall, pretty standard stuff. However, Bloomberg’s Kathleen Hays challenged Yellen to explain “what happened between December and March” that warrants a rate hike (you can watch the exchange here). In short, Yellen ignored the concerns raised by Hays and then pivoted to one of the Fed’s dual mandate, maximum employment in this case. And on that note, let me just point out that the Fed is solely focused on its dual mandate, and “not economic growth per se,” as Yellen explained during her February testimonies. This is why Yellen hinted at a rate hike during her March 3 speech, even though Yellen openly admitted in that speech that “the ongoing expansion [in the U.S. economy] has been the slowest since World War II, with real GDP growth averaging only about 2 percent per year.” And for reference, historical U.S. average growth is around 3.2% per year. Kashkari’s dissent was a bit disappointing, but somewhat expected, so no biggie there. A little profit-taking was also to be expected, given that the rate hike was widely expected, thanks to the media blitzkrieg launched by the Fed ahead of the March FOMC meeting. Even so, the Greenback’s reaction was too big for mere profit-taking. In fact, it looks like the Greenback got the rug pulled from under its feet, metaphorically speaking of course. 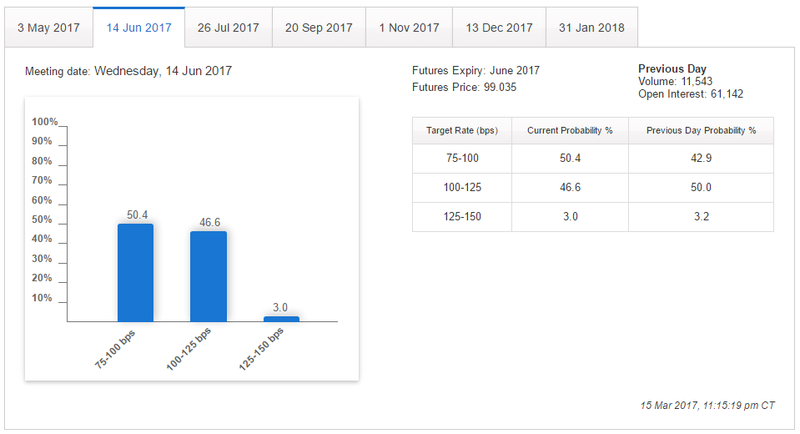 A big clue to the Greenback’s rather strong bearish reaction is that odds for a June rate hike dropped from 53.2% to 49.6%, according to the CME Group’s FedWatch Tool. This means that the market no longer thinks that a followup rate hike by June is quite likely. Okay, cool. But why would the market lower its rate hike expectations? Well, market analysts blamed that on disappointment over the Fed’s unchanged economic outlook and, perhaps more importantly, the Fed’s unchanged projections for the Fed Funds Rate. After all, the Fed did hype the market for the March rate hike. And given the Fed’s activity of signaling an early March rate hike, expectations were high that the Fed would upgrade its projections for the Fed Funds Rate, or at least its economic projections. However, the Fed didn’t do either of those things, which the market apparently found very disappointing.